There is a new No. 1 in this week’s Kpreps Rankings. Check out the top five polls as we enter the bracket round for Class 6A and 5A and wind down the regular season in all other classifications. This week’s Class 6A top five remains the same, but top-ranked Lawrence Free State survived a scare for the second consecutive week. After rallying from 18 points down against Olathe East last week, the Firebirds needed a game-winning field goal from Kameron Lake to beat cross-town rival Lawrence, 24-21. Shawnee Mission East had little trouble in a 63-0 shutout of struggling Shawnee Mission West. The Lancers open the bracket round as the No. 1 seed on the east side of Class 6A and will host 16-seed Gardner-Edgerton. Last season, the Lancers survived a playoff scare from the Blazers, 36-35. Derby got a solid challenge from Haysville Campus for more than a half, but the Panthers eventually pulled away for a 48-20 win. The Panthers will host Dodge City in the bracket round this week. Fourth-ranked Wichita Northwest had no trouble in a 68-8 victory over Wichita Southeast. In one of the quirks to the new postseason format, the Grizzlies will host Wichita Southeast again this week. Manhattan picked up a solid road win at Blue Valley Northwest, 50-22. The Indians earned the 4-seed on the west side of Class 6A and will host Wichita East this week. Top-ranked Goddard built a 35-0 halftime lead in beating Newton, 48-14 on Friday. Senior quarterback Blake Sullivan returned to the starting line-up for the Lions after missing the past two weeks with an injury. 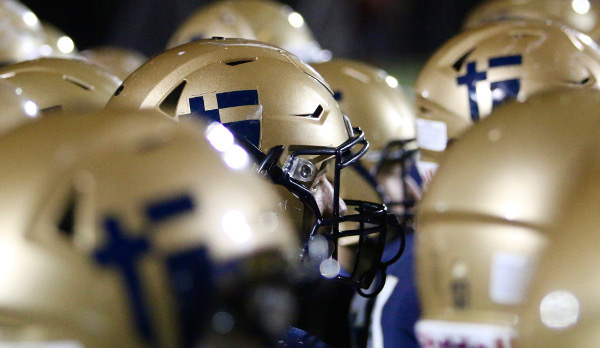 Second-ranked St. Thomas Aquinas used a big second quarter to pull away from Blue Valley during a 47-20 win. The Saints scored three touchdowns in the final five minutes of the first half to turn a 21-6 lead into a 40-13 lead at the half. Bishop Carroll remains ranked third this week after a 30-22 victory over rival Kapaun Mount Carmel in the “Holy War”. Carroll trailed 13-0 early and 22-21 in the second half before a touchdown pass from Braden Howell to Cade Becker put the Eagles in front for good. Wichita Heights up one spot back to No. 4 this week after a 48-12 win over Wichita South. Last week’s No. 4 team, Shawnee Heights, dropped a 19-14 decision at Emporia and fell out of the top five. Maize enters the poll for the first time this season at No. 5. The Eagles moved to 7-1 on the season with a 14-13 victory over Hutchinson. Bishop Miege won the battle of No. 1 vs. No. 2 last week by shutting out De Soto, 31-0. The Stags led 17-0 at halftime and scored twice more in the second half as sophomore receiver Daniel Jackson accounted for three touchdowns. De Soto never could get its option attack going against the Miege defense. The Wildcats drop one spot to No. 3 this week. Andale moves up into the No. 2 spot after rolling past Towanda-Circle, 70-7. The Indians host El Dorado this week. Maize South stays in the No. 4 spot after rolling past Rose Hill, 48-14. Meanwhile, McPherson stays ranked fifth after a 47-0 shutout of Wamego. Scott City takes over the top spot in Class 4A-II this week thanks to Pratt’s loss at Holcomb. The Beavers remain unbeaten on the season with a 28-0 shutout of Goodland. Meanwhile, Holcomb climbs to the No. 2 spot after snapping Pratt’s 15-game win streak with a 19-14 victory. Pratt falls two spots to No. 3 in this week’s poll. Topeka Hayden jumps back into the poll at No. 4 after a 27-13 victory over Holton. The Wildcats are 4-4, but all four losses have come to 6A and 5A competition. Smoky Valley stays in the No. 5 spot this week after a 43-12 victory over Chapman. The Vikings will play for a district championship this week when they travel to Clay Center. Nemaha Central cruised to a 49-0 shutout of Riverside to remain atop the Class 3A poll. Similarly, No. 2 Phillipsburg had little trouble in dominating rival Norton, 56-0. The Panthers shut down Jace Ruder and the Bluejays in ending Norton’s six-game winning streak at Phillipsburg. Conway Springs moves up a spot to No. 3 this week after shutting out Cheney, 41-0. Both sets of Cardinals entered this game with identical 7-0 records. Conway Springs has won the first two showdowns in the tough District 10, and will host Chaparral this week. Silver Lake drops one spot to No. 4 this week. The Eagles held off Perry-Lecompton, 40-35. It was Silver Lake’s third straight close victory in the series. The Eagles beat the Kaws 21-19 last season, and escaped with a 39-38 overtime win two years ago. Galena remains at No. 5 in this week’s poll. The Bulldogs rolled past Southeast-Cherokee, 57-7 and will host nearby rival Riverton this week. Galena and Riverton are separated by a little more than three miles on Route 66. For a second straight week top-ranked Smith Center put up at least 70 points and held its opponent scoreless. Friday the Redmen beat Republic County 70-0. Smith Center will travel to unbeaten Ell-Saline this week. Second-ranked Lyndon posted its first shutout of the season in beating Chase County, 41-0. The Tigers will likely face their biggest challenge of the season this week when they host Olpe (6-2). Olpe defeated Lyndon 26-20 last season to close out the regular season. Jefferson County North stays ranked in the No. 3 spot this week. The Chargers eliminated defending-champion Troy with a 46-0 victory on Friday. Centralia remains in the No. 4 spot this week. The Panthers rallied to defeat Valley Heights 30-22 on Friday to clinch a playoff spot. Valley Heights, despite being ranked for most of the season, was eliminated from playoff contention with district losses to Centralia and Jackson Heights. Centralia takes on unbeaten Jackson Heights this week. Fifth-ranked St. Mary’s Colgan cruised to a 63-6 victory over Oswego. The Panthers will host Uniontown this week. For the third consecutive week, Burlingame remains in the top spot by one vote over No. 2 Spearville. The Bearcats rolled to a 53-0 win over Rural Vista for their fourth consecutive shutout and their sixth of the season. Meanwhile, Spearville rolled to a 46-0 blanking of Leoti-Wichita County. Osborne remains in the No. 3 spot after doubling-up Bennington, 32-16. The Bulldogs handed their Bulldog counterparts a third consecutive loss in the brutal District 4. Saint Francis returned to the field after a week off and showed little rust in a 54-6 victory over Quinter. The Indians handed Quinter a 28th consecutive defeat. Hoxie removed Hill City from the four-way tie atop District 8 with a 52-6 victory. Hoxie, Hill City, Saint Francis, and Atwood-Rawlins County all entered last week tied with 3-1 records in District 8. Hoxie can clinch a playoff spot with a win by six or more points over Oberlin-Decatur Community this week. Hanover’s streak of five consecutive shutouts ended on Friday, but the Wildcats still cruised to a 20th straight victory, 62-12 over Wakefield. Pike Valley stays in the No. 2 spot cruising to a 52-6 victory over Beloit St. John’s-Tipton. The Panthers close out the regular season at Linn. Otis-Bison blasted Triplains-Brewster 64-0 on Friday to improve to 7-1. Now the highly anticipated showdown with Hodgeman County is set for this week with the District 6 championship on the line. Both the Cougars and Longhorns have already qualified for the playoffs. Hodgeman County handed Dighton a second straight loss with a 46-6 win on Friday. Speaking of highly-anticipated showdowns, No. 5 Hutchinson Central Christian will travel to unbeaten Caldwell this week to decide the District 2 title. Central Christian had no trouble last week in a 74-6 victory over Burrton.